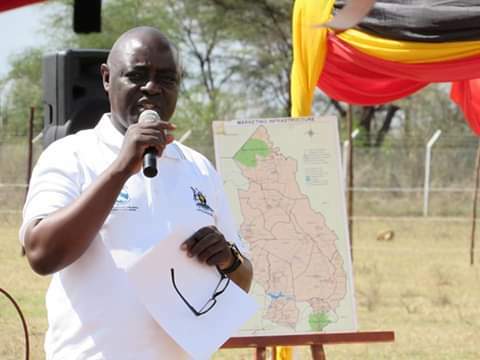 KARAMOJA- Mr Vincent Sempijja, the Minister for Agriculture, Animal Industry and Fisheries, has officially launched the roll-out of the Regional Pastoral Livelihoods Resilience Project for 13 districts in Karamoja sub-region. For the past three years, the Ministry of Agriculture, Animal Industry and Fisheries has been implementing a project called “the Regional Pastoral Livelihoods Resilience Project” as a project aimed at enhancing resilience of pastoral and agro-pastoral communities in cross-border drought-prone areas in 13 districts of Karamoja sub-region. The project was designed to achieve this target through four project components which include Natural Resource Management, Market Access and Trade, Livelihood Support and Pastoral Risk Management. At the launch, Hon. 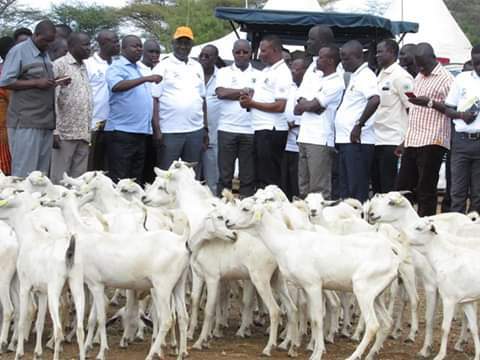 Sempijja was joined by the Permanent Secretary Mr. Pius Wakabi Kasajja and the Project Coordinator Dr. Charles Kajura in handing over 900 goats, 360 bulls and apiary inputs to representatives of the 13 beneficiary districts who included farmer group leaders, LC5 Chairpersons and Chief Administrative Officers. The handover took place at the Ministry holding grounds in Nanduget, Moroto district. The RPLRP is aligned to four strategic objectives of the CAS: promote inclusive and sustainable economic growth; enhance public infrastructure; strengthen human capital development; and improve good governance and value for money. The RRLRP is also consistent with the Agriculture Sector Development Strategy and Investment Plan (DSIP) 2010/11-2014/15, and specifically, with sub-programs on production and productivity, market access and value addition, enabling environment, and institutional strengthening. DSIP emphasizes pastoral issues and climate change. The RPLRP will directly contribute to implementing the dairy and meat action plans formulated following the DSIP. Both plans recognize the ASALs as the main sources of cattle and ruminants in Uganda, notably the so-called “cattle corridor” and the north- eastern part of the country (Karamoja region).